I hope it's not inappropriate to share this, but AHeckman2's setup video helped me out. Here's my setup for outdoors. Just put down and change from there that's what I did because you will never ride the same as someone else. Hi Im Skyqe wrote: In MXS our low speed adjusts the curve of the damping from progressive (0-49) linear (50) and digressive (51-100). Most people don't know this still. For landing large hits its good to have compression in digressive setting: 51-100? Or is it beneficial to have some digressive for typical gp/rough tracks anyway? 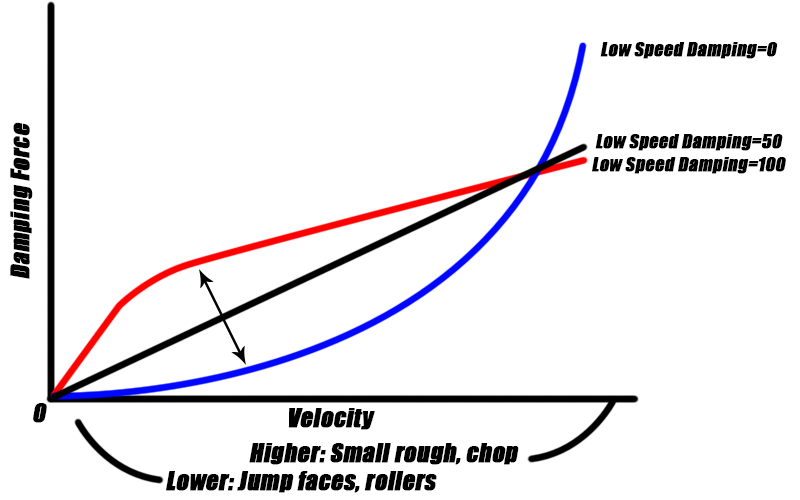 Ive heard that low speed rebound should be 0-49 in order to work the best? Love the setup but I slide to much can someone help?? I know SX is still ways away and nationals aren't finished yet but I'm already getting ready for SX. Any1 have a good SX setup? RevLimiter wrote: I know SX is still ways away and nationals aren't finished yet but I'm already getting ready for SX. Any1 have a good SX setup? came here to ask the same thing haha. I did terrible in outdoors and want to be ready for sx. Should I consider "high speed" comp and rebound for whoops and harsh landings and "Low speed" for turns and jump faces/ smooth landings? Or am I going in the wrong direction? High speed compression is your compression adjustment. Low speed adjusts the curve of the valving from 0-49 progressive 50 linear and 51-100 digressive. 50 will be your zero point and the further away from 50 you get the more drastic the valving change will be. Same goes for rebound. Hey everyone need some help with setup. I run my stability on 20 but that's all i've really played with. I have got the hang of the basic physics and throwing small whips in MXS. But i want to throw bigger whips and be able to scrub, all with not loosing too much of how stabil my bike is. Can anyone help me understand what settings effect front and rear wheel traction? Made this new setup. Its pretty good. Try it out and tell me what u think!